There are no shortcuts to the big game. Players have worked their whole lives to have this opportunity, putting in thousands of hours on the field. Learning. Practicing. Perfecting skills, techniques and strategies. And doing so day after day and week after week. Likewise, there are no shortcuts to successful organizations. It requires hard work and extraordinary amounts of practice to hit success. There is no way to reach the Super Bowl without a crazy amount of sacrifice from the owners, coaches and players as well as their families. Time away from kids. Nights away from a spouse. Not just once in a while, but for weeks at a time. Leading an organization requires sacrifice too. Sometimes leaders believe they can have it all – success without sacrifice. Forget it. No pain, no gain. Even the best players need a coach – someone who can see the bigger picture and who can provide guidance that helps talent to surface and be leveraged for the greatest good of the team. Team members and senior leaders of organizations can also benefit from coaching. Few successful NFL players would be above good coaching, and the same should be true for us as leaders. Risk is required to make it to the big game. After all, while being the second best team in the NFL is no small accomplishment, it still means you lost. Playing requires the risk of losing. Owners take risks with how they spend their money. Coaches take risks with whom they draft or sign as well as whom they play. Risky decisions are made in play calling especially in the 4th down. And players take risks with the potential for serious injuries. No organizational leader or founder has reached a higher level of success without taking risks. Can you imagine what it is like stepping onto the field in that epic game? The noise. The lights. The cameras. The intense energy. The pressure to succeed and the potential for failure. To reach this level of play, an athlete has to be able to focus by tuning out the noise and zeroing in on the mission, and staying in that zone until the game is over. Successful leaders and organizations need a similar ability to focus and not get sidetracked by the many distractions that can blur their vision and sense of direction. While every super bowl will have an MVP, there is no such thing as a one player team. Yes, there are some players whose skills are more visible and translate into more measurable results, but they still need others to succeed. And our organizations are no different. A successful team values, trusts and respects one another and views the team more as a “we” than an “I”. Dr. Rosabeth Moss Kanter’s book, Confidence: How Winning Streaks and Losing Streaks Begin and End, looks at what differentiates winning teams from losing teams. She identifies one of the big differences as confidence – how teams move towards positivity even after a bad play or loss and how they land on their feet to once again move towards winning. Dr. Kanter notes, “Confidence isn’t optimism or pessimism, and it’s not a character attribute. It’s the expectation of a positive outcome.” In other words, she believes confidence is contagious! No one ends up just “going to the Super Bowl.” It is an accumulation of many small steps starting years earlier. Practicing. Winning. Losing. Listening. Refusing to quit. Getting to the mother of all games requires a lot of smaller wins, not only in the present season but in many prior seasons. We would be wise to remember that our organizations also advance based upon small wins. 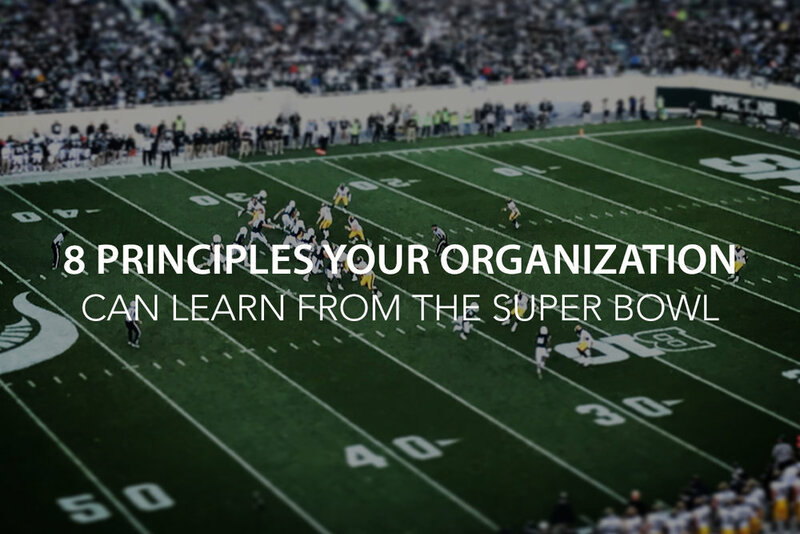 Every event, product or service cannot be the Super Bowl. Teams grow by a successive number of smaller wins.